Burner head is connected with the venturi, it is an important part for the gas stoves. There are many types of burner heads, such as round, circle, single plate, double plates, multi furnace head etc. Most of burner heads were made by sand casting processes in China. The most common material for burner head is gray cast iron ASTM A48 CLASS 25 B. 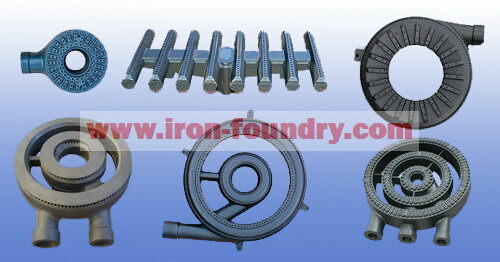 This material is equivalent to Chinese cast iron grade HT150 to HT200. Or, equivalent to Germany standard GG15 to GG20. This material is very normal and cheap, but it has good founding properties. Sand casting processes are suitable to produce burner head products. If you want to meet high surface quality, e.g. smooth surfaces, and less casting defects, then shell and core molding process is necessary. Otherwise, normal green sand casting process is also applicable. However, the green sand must have very fine and uniform sand grain. Of course, shell molding castings will be more expensive than green sand castings. The main machining works are drilling the small vent holes on the top of burner heads. One burner heads may have dozens to hundreds small holes. So, need lots of drilling works. Moreover, more holes will cause higher defective rate during machining process. Not every foundry could drill them very well since dedicated and low cost works are necessary. The burner head castings shall be smooth, cleaned, free from harmful porosity, cracks and inclusions, and any other casting defects detrimental to appearance and performance. Normal defects found on burner heads will include sand holes, air holes, broken vent holes, slag inclusion, deformation etc. The iron foundries need carefully deal with the casting process, pouring, sand cleaning, grinding and drilling works very carefully. By shell molding process, the raw castings cost will be higher. The machining prices will depend on the total amount of vent holes.